You provide us some information about yourself if you register for our email list or become a member of NKD. These data may include your name, email address, street address, phone number, and social media handles. As part of an account profile on our NKD or RepYourBlock (RYB) websites, you may optionally provide us with information such as a bio, website link, profile image, or support statement. NKD may produce optional surveys and collect responses. If you sign up to get involved in NKD committees, subcommittees, projects, campaigning opportunities, or club events (including meeting RSVPs), we may retain this information. Additionally, we collect and retain meeting attendance for the purposes of validating eligibility for participating in club elections. If you correspond with us by email, we may retain the content of your email messages, your email address, and our responses. We may also retain any messages you send through the NKD Slack team. You may provide us information in user content you post to the NKD website. Information on public activity related to NKD’s social media accounts (e.g. Facebook, Twitter, Instagram) such as “liking” or commenting on a post, or RSVPing to a Facebook event, may be retained. If you volunteer to help raise contributions or sell event tickets, we may retain information on contributions or pledges attributable to your efforts. For the purposes of reporting on political contribution through required filings, we collect and retain information from any person or entity making a contribution to NKD, including address, occupation, and employer. Finally, we periodically request public voter registration data from the New York State Board of Elections for election purposes. NKD uses the NationBuilder platform to organize our community of members, send club emails, and maintain the NKD and RYB websites. When you visit either of these websites, NationBuilder may send one or more cookies—a small text file containing a string of alphanumeric characters—to your computer that uniquely identifies your browser and lets NationBuilder help you log in faster and enhance your navigation through our site. NationBuilder cookies do not collect personal information about you. A persistent cookie remains on your hard drive after you close your browser. Persistent cookies may be used by your browser on subsequent visits to the site and can be removed by following your web browser’s directions. A session cookie is temporary and disappears after you close your browser. You can reset your web browser to refuse all cookies or to indicate when a cookie is being sent. However, some features of the NKD and RepYourBlock websites may not function properly if the ability to accept cookies is disabled. You can read more about how the NationBuilder service interacts with and protects your information at nationbuilder.com/privacy and nationbuilder.com/confidentiality. Further, NKD uses Google Analytics to help understand use of the NKD and RepYourBlock websites. This service collects the information sent by your browser as part of a web page request, including cookies and your IP address, and Google’s use of it is governed by the Google Analytics Terms of Service. We use a third party processor (Democracy Engine) to handle contributions to NKD, and we do not collect or retain credit card or other billing information. NKD endorsements, approval of policy platforms, and elections of NKD leadership are all conducted through anonymous voting procedures; no information on how our members vote is collected or retained. We may collect information through your engagement with the NKD or RYB websites, through your engagement with our social media accounts, through sign-in sheets at our club meetings, through voluntary surveys (online and offline), or through other optional sign-up forms at NKD-related events. NKD uses your information to get in touch with you to provide important updates on our work, announce meetings and events, and provide other club-related information. If you reach out to us, we may respond to you using contact information you’ve provided to us. 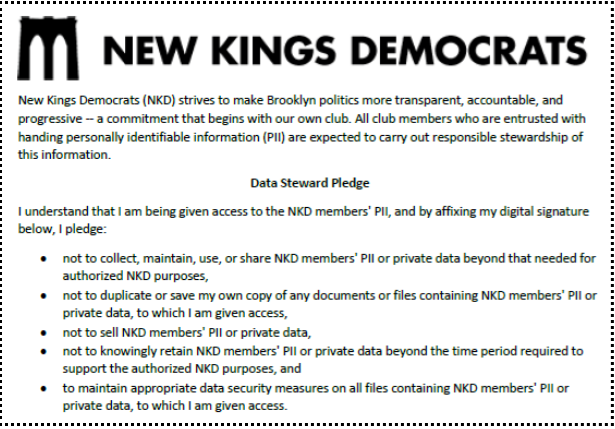 Additionally, information you’ve provided may be de-identified and aggregated to help the club’s elected leaders inform NKD strategy by assessing our growth over time, evaluating members’ interests and engagement, and surveying our members’ representation across Brooklyn neighborhoods and electoral districts. Your NKD profile data is not publicly available via the website, nor is it visible to search engines. Some pages on the NKD and RYB websites allow you to make your NKD engagement public, visible among a list of people who have signed up to volunteer/join, made a contribution, or responded for an upcoming meeting/event. You always have control over whether these activities are made public on applicable pages. All of our emails include an unsubscribe link, which allows you to opt out of emails. Once you create a profile though the RepYourBlock website, you can log in to view and correct your profile information. You can also reach out to us by email if you ever have any questions about your NKD data or want to correct any piece of information on your account. Additionally, you can reach out to us by email (see “How to Contact Us” below) to delete your account and personal information. Physical materials that contain your information (e.g., paper sign-in sheets) are securely destroyed as soon as possible. Your NKD profile data is stored securely in our database. Following termination or deactivation of your membership, NKD may retain your profile information and all information posted to public areas of the site. You can get in touch with us by email (see “How to Contact Us” below) to permanently delete your account and profile information at any time. We take precautions to protect your information online and offline. Our websites and database are hosted by NationBuilder, and are stored on an isolated private database completely separate from any other NationBuilder data (consult the NationBuilder Terms of Service for more information). All files and data that contains or pertains to NKD members’ personally identifiable information is stored securely, whether in our database or in password-protected storage. In the event of data breach, it is our policy to provide notifications to you via email and through conspicuous posting of such notice on the NKD website. Your privacy settings may also be affected by changes to the functionality of third-party providers, such as social networks. To protect your privacy and security, we take reasonable steps (e.g., requesting a unique password) to verify your identity before granting you access to your NKD account. You are responsible for maintaining the secrecy of your unique password and account information, and for controlling access to your email communications from NKD at all times.